How to Prevent Sun Damage? Sun damage not only leads to premature aging of the skin, but it also increases the risk of skin cancer. Melanoma, squamous cell carcinoma, and basal cell carcinoma are three common types of skin cancer that may be caused due to excessive sun exposure. Protecting against daily direct or indirect exposure to the sun is important. The American Academy of Dermatology recommends sunscreen products with an SPF of 15 or higher. The sunscreen should provide broad spectrum UVA and UVB protection. Moisturizers may also be used to defend against incidental UV exposure. Sunscreen should be applied to the face, lips, ears, and neck. In case of a balding person, the scalp must also be protected. 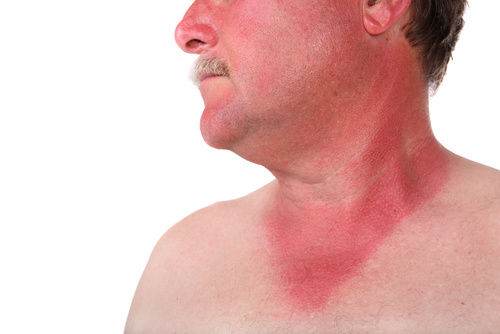 Sunscreen should be applied ideally 20 minutes prior to contact with UV rays. For extended sun exposure, the sunscreen application should be repeated every two to three hours. The best way to minimize sun damage is to look for shade on every possible opportunity. When visiting outdoors on foot in a sunny weather, it is better to carry a sunblocker or UV protection umbrella. Even inside the home or office, the sun-facing window panes should be UV-protected. It is recommended to wear full-length clothes that are loose fitting and firmly woven when traveling outdoors in the sun. A wide-brimmed hat can be used to provide additional protection from the sun. Sunglasses that block almost 100 percent of UV rays should be used. Car windows should also be geared to protect against UV rays. The harmful UV rays are most intense between 10 am and 4 pm. It is advisable to avoid direct exposure to sun during these hours. This will help to limit the chances of sun damage. The temptation to get tanned skin should be resisted as far as possible. Avoiding the noon sun is particularly important for people who have a previous history of sunburns and other sun damage. Even artificial UV light in the home should be avoided to minimize damage to the skin. The dermatologist can offer expert advice regarding which sunscreens to use and what other precautions to observe. The dermatologist can guide how to conduct a periodic self-examination to identify signs of sun damage. Periodic appointments with a skin expert can help to discover any abnormal spots or alterations to the skin. Timely treatment is crucial in case of sun damage, and professional guidance can help to prevent the chances of complications.